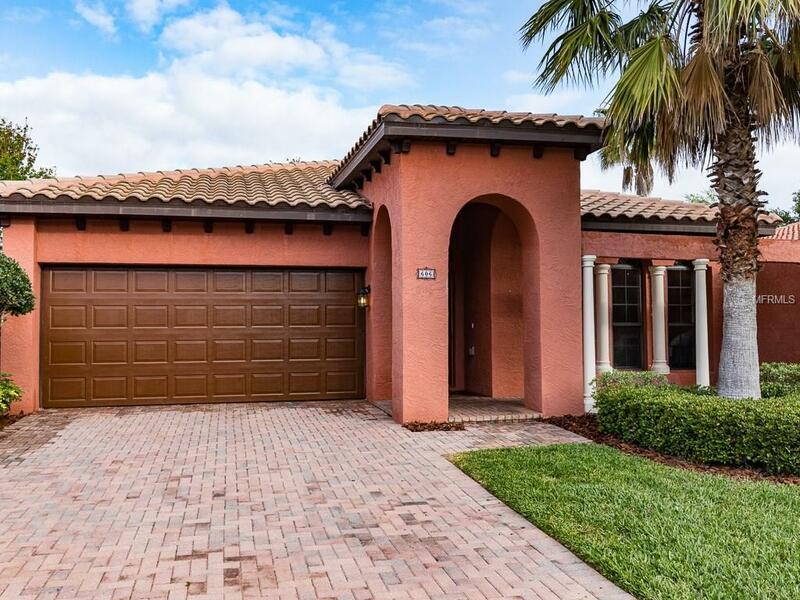 Beautiful Mediterranean Style, 4 bedrooms, 2 bath home with 2 car garage in Riviera Bella Community with access to the St. John's River. Spacious and open interior of more than 2,000 square feet of living space which is loaded with architectural details such as a tile roof, unique archways both inside and out, driveway of pavers, lovely courtyard and built ins. Walk into the open and airy living room/dining room combination. The oversized kitchen features large maple cabinets, granite counter tops, stainless steel appliances and breakfast bar which opens to the family room. From the large family room step through the sliding glass doors to the covered patio which is great for entertaining. The oversized master bedroom featuring a walk in closet and large linen closet. There is also an in-suite master bathroom with a soak in tub and separate shower. The three-way split bedroom plan is very convenient with the Master on its own off the Family room, one of the bedrooms off the kitchen and the other two bedrooms off the family room, sharing the second bathroom. Newly installed tile floors in living/dining room, family room and kitchen. Riviera Bella community offers gated entrance, a club house, beach-style pool, fitness center, community playground and a boat ramp into the St. Johns River. You dont want to miss this one! Make appointment to see this wonderful home today!